Enhance the ability of self-care and self-confidence. Learning dressing skills can enhance self-care ability, establish good habits and develop a sense of responsibility and self-confidence. 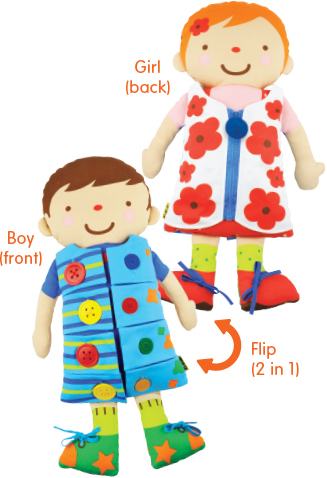 Children can practice zipping, tying and buttoning with 2 in 1 Dress Up Doll. Buttons are designed in two sizes which can be used to practice in different levels of difficulty. Size of buttons is designated for child, which can make the dressing training simpler and easier, boost his self-confidence. 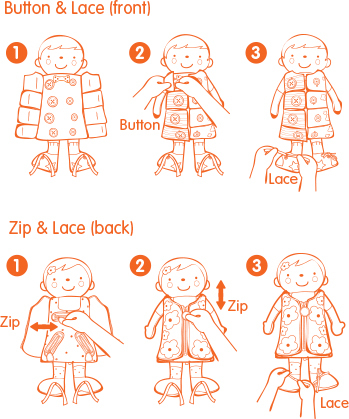 Dressing skills enable precision movements, train fine motor skills and eye-hand coordination.